We love the X-T1, but the new Fujifilm X-T2 has received major improvements that make it a serious contender to just about any mirrorless camera on the market. Most notable are the increased megapixels (24 vs. 16), drastically improved autofocus, and 4K video functionality that turns a weakness into a strength. Below we pick the best lenses for the Fujifilm X-T2, including top prime and zoom lens options from kit and wide angle to portrait and telephoto. Keep in mind that Fujifilm’s native lenses go by the Fujinon moniker and have a 1.5x focal length equivalent. For more background, see our lens buying advice below the picks. What we like: Great build quality and reasonably fast for a mid-range zoom. What we don’t: Not an all-in-one lens solution like the 18-135mm. In creating the 18-55mm f/2.8-4, Fujifilm completely disregarded the notion that kit lenses have to be mediocre. This lens has a sturdy metal build, is sharp, boasts excellent color rendition, and has a relatively fast maximum aperture of f/2.8-4. All in all, it puts 18-55mm kit lenses sold with other cameras to shame, even from top players like Canon and Nikon. And the icing on the cake: at only $300 more than the cost of the camera, the Fujfilm X-T2 kit is a great value (the lens on its own is $700). We’ve shot with this lens on the X-T1 for well over a year and the only real shortcoming is that the 27mm equivalent at the wide end can be too narrow for true landscape specialists. It is, however, a great travel and people lens for those who don’t want to spend up for primes. What we like: Super sharp and fast autofocus. The wide-angle lens options for the Fujifilm X-T2 are strong, and our top pick is the 10-24mm f/4. You get superb optics with great sharpness and fast autofocus. Many of the issues that are commonly found with wide-angle zooms—heavy distortion, vignetting and softness—just aren’t present on this lens. The only notable weakness is the f/4 maximum aperture, but the lens does have optical image stabilization for low light. And we would love to see weather sealing added in the future for our fellow outdoor photographers, but the Fujinon 10-24mm f/4 still is a top-notch wide-angle zoom. What we like: One step faster than the 10-24mm above. What we don’t: Pricey for a prime. If you frequently shoot landscapes or other wide-angle photos and want to go the prime route, the Fujinon 14mm f/2.8 is the leading option for the X-T2. With a focal length equivalent of 21mm on a 35mm camera, it’s wide enough for grand landscapes but not too wide (you can read more about our favorite focal lengths for landscapes here). The lens also has a sturdy all-metal build and produces sharp, high-quality images with minimal distortion. All things considered, we favor the 10-24mm above for the versatility, but the 14mm f/2.8 is an outstanding lens. Another option is the fast Fujinon 16mm f/1.4, but that lens is heavier and we prefer the 21mm equivalent focal length over 24mm. What we like: A great value for a wide-angle lens. What we don't: Manual focus isn’t for everyone. Given the rather expensive wide-angle lens options above, we are thinking outside the box with the Rokinon 12mm f/2. This manual focus lens comes in a variety of mounts and is very reasonably priced at around $400. But perhaps most impressive is its maximum aperture of f/2, which is terrific for astrophotography and other low light photography. Manual focusing may be a hurdle for some photographers (we found it to be a bit clunky on this lens), but we love the sharpness and build quality. For comparison, the Zeiss 12mm Touit has similar optics and is more than double the cost. What we like: Small size and fast autofocus. What we don’t: Bokeh can't match the pricier 23mm f/1.4. For years the Fujinon 23mm f/1.4 was the leading option at this focal length, but that lens is considerably more expensive and heavier. Enter the new 23mm f/2, which is one stop slower in terms of maximum aperture but still an outstanding lens from an optical perspective. We like spending less, not to mention the f/2 version weighs only 6.4 ounces and is weather sealed. Combine it with the Fujifilm X-T2 and you have one of the premier set-ups for street photography in a compact and lightweight package. The cherry on top: the autofocus on the 23mm f/2 is extremely fast and nearly silent. What we like: Compact and a good value. What we don’t: Optics are good but not great. Let us start by saying that 27mm (equivalent to 41.5mm) is an interesting focal length, sitting in-between the popular 35mm and 50mm focal lengths. But if cost and weight are at a premium, this pancake-style lens has a super low profile and impressive optics for the price. At just 2.8 ounces, it’s reasonably sharp, good in low light, and you’ll barely even notice it’s on your camera. Enthusiasts and professionals may prefer a faster prime, but this lens is a nice alternative for those who don’t want to spend big for the primes above and below. What we like: Sharpness and low light performance. At 52.5mm on a 35mm camera, this “nifty fifty” (or close to it) is another very strong prime from Fujifilm. It performs extremely well in low light, is sharp, produces excellent bokeh, and weighs just 6.6 ounces. The biggest issue is that the autofocus can be slower than you might expect from a 50mm prime (the new autofocus system on the X-T2 should help). But the focus is accurate, which is critical, and it’s an otherwise outstanding lens. 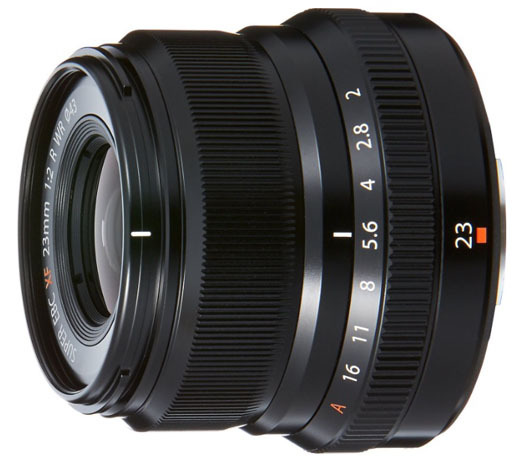 For a less expensive option, try the Fujinon 35mm f/2. What we like: Superb optics and low light performance. This is the kind of lens that people switch camera systems for. If you had any doubts about mirrorless matching the image quality of Canon or Nikon DSLR lenses, give the Fujinon 56mm f/1.2 a serious look. This short tele is outstanding for portraits with a blazing fast f/1.2 maximum aperture, almost no distortion, and impressive sharpness edge to edge. All things considered, it’s the best portrait lens for the X-T2 and can go head to head with any lens of its kind, mirrorless or otherwise. Our only real gripe is the lens is not weather resistant (the new 23mm f/2 is weather sealed as are many Canon and Nikon lenses of this caliber). What we like: Good optics and low light performance for a telephoto zoom. What we don’t: Autofocus has a tendency to hunt. Telephoto lenses seldom are perfect, but this Fujinon does everything that it should at a reasonable price point. It’s sharp throughout its zoom range, performs well in low light for a telephoto zoom, and comes with optical image stabilization for hand held shots. The biggest shortcoming is its weight at 20.5 ounces, which can feel heavy and bulky on a compact camera like the X-T2. The 50-230mm below is cheaper, lighter, and has a slightly longer reach, but is not nearly as good from an optical perspective. Those who need a faster telephoto should consider the pricey Fujinon 50-140mm f/2.8. What we don’t: Subpar in low light. For those who shoot telephoto infrequently but still want something in their bag should the situation arise, the Fujinon 50-230mm f/4.5-6.7 is a decent budget option. We aren’t crazy about the low light performance of this lens, even with the optical image stabilization. But it does have an impressive focal length range equivalent to 76-350mm on a 35mm camera, giving you more reach than the 55-200mm f/3.5-4.8 above. If you plan on doing most of your telephoto shooting in normal or bright conditions, the image quality of the Fujifilm 50-230mm should do the job. What we like: Weather sealed for outdoor photography. What we don’t: 27mm equivalent isn’t wide quite enough for serious landscape photographers. If you’re looking for an all-in-one lens for the Fujfilm X-T2, the 18-135mm f/3.5-5.6 is a nice choice. With a focal length range of 27-206mm on a 35mm camera, it covers everything from wide angle to telephoto and is weather sealed to boot. We like this 18-135mm for travel and as an everyday walk-around lens, but it’s not quite wide enough for serious landscape photographers and is on the heavy side. In general, we prefer more specialized prime and zoom lenses over an all-in-one, but the 18-135mm f/3.5-5.6 is a good option for those who value the versatility. Without a doubt, we would start by picking up the Fujinon 18-55mm f/2.8-4 kit. We’ve used this lens for nearly two years on the X-T1 and have been blown away by its accuracy, sharpness, low light performance, and overall image quality (it’s a kit lens only in name). More, the kit is a great value at only $300 more than the cost of the camera (the lens on its own is $700). It’s true that this lens can’t exactly replace all of your primes, but together those would cost a couple thousand dollars and wouldn’t outperform this lens by all that much. The X-T2 wouldn’t be our first choice for landscape photography—Digital SLRs are a better value and this camera really excels for people shots. Therefore we would pass on wide-angle lenses like the Fujinon 10-24mm f/4 and 21mm f/2.8. Taking the camera body and lenses into account, they’re just too expensive. For travel and portrait photography, we highly recommend adding a fast prime to compliment the X-T2. This is exactly the type of lens that the camera is made for. The new 23mm f/2 is a reasonably priced option that is weather sealed and great for street photography. The Fujinon 35mm f/1.4 is a superb 52.5mm equivalent that checks all the boxes for those who shoot people photos. For close-up portraits, the Fujinon 56mm f/1.2 is extremely fast but too pricey and heavy for our tastes. Similar to wide-angle photography, the X-T2 wouldn’t be our go-to for telephoto uses—you can find faster cameras for cheaper. Having said that, the 55-200mm f/3.5-4.8 is the logical choice for those who don’t want to go without a tele lens in their bag. We’ve done so multiple times and ended up regretting the choice on occasion, so getting that lens is really a cost/benefit analysis that every photographer has to make. Lens focal lengths are described using 35mm film as the reference point. Because the image sensors on Fujifilm mirrorless cameras like the X-T2 are 1.5 times smaller than a 35mm camera, you multiply a lens’s listed focal length by 1.5 to determine its equivalent. For example, a Fujinon lens listed as 14mm will behave like a 21mm lens would on a 35mm camera. If you’ve used a full-frame camera, crop factor can be very helpful in choosing your lenses. Different mirrorless camera brands have different crop factors so it’s important to understand the equivalent focal lengths to know what you are buying and make proper comparisons. To help in the process, we’ve listed the focal length equivalents in the specs below each lens and in our comparison table. All of the zoom lenses on the list have Optical Image Stabilization (OIS), which is great and can help to offset camera shake when natural light is low. None of the prime lenses on this list offer OIS functionality, but frankly they don’t need it. When you are dealing with a fast maximum aperture such f/2 or below, plenty of light should be entering the lens and camera shake is much less of an issue. It’s worth noting the Fujifilm X-T2 body does not have in-camera image stabilization—this feature usually is saved for high-end and full-frame cameras. One thing you may notice on this list is that Fujifilm seems to focus on prime lenses more than other lens manufacturers. Nikon and Canon, for example, are constantly improving and pushing their zoom offerings to consumers, but Fujifilm favors primes and it’s apparent. Even the 18-55mm lens offered with the X-T2 has an f/2.8 maximum aperture at the wide end, which is much faster than the norm. The bottom line is that the X-T2 speaks most to people who are seeking high image quality—the target audience is more akin to full-frame buyers than the entry-level market. We like zoom lenses like the 10-24mm f/4, and the 18-55mm f/2.8-4 is much better than other kit lenses, but don’t pass on the opportunity to grab a Fujinon prime or two. The image quality is superb and you won’t regret it. Given the cost and technical difficulties of adapters, we tend to think of them more for pricey full-frame lenses than crop sensor models. In addition, the weight and bulk of many DSLR lenses will be noticeable on a small mirrorless camera like the X-T2. Most lenses should be useable, but they are larger than lenses built specifically for mirrorless. We wanted to acknowledge here the Zeiss Touit collection: a series of prime lenses with mounts for Fujifilm and Sony. First, we absolutely love Zeiss lenses and always are excited about their image and build quality. It just so happens that we think the Fujinon offerings for the X-T2 are superior, not to mention they are in the same price ballpark as the Touit lenses. However, if you own a Sony mirrorless camera like the Alpha a6300, the Touit lenses are nice high-end options where there isn’t anything comparable from the manufacturer itself. The point is that we did consider them, but ultimately did not include them, on this list.